Winter is one of those seasons that you need to double up on things. Clothes, blankets, positive thoughts and easy to make nutritious meals. One of the best cures for winter blues, seasonal flus and a drop in spirits matching the declining temperatures – is a damn good home cooked meal. Not only is the act of cooking therapeutic, it also replenishes vital nutrients and vitamins that we lose throughout the day, most of which can only be sourced through fresh food. This is important to note, as wholesome nutrition plays a major role in maintaining not only physical health, but also emotional balance. 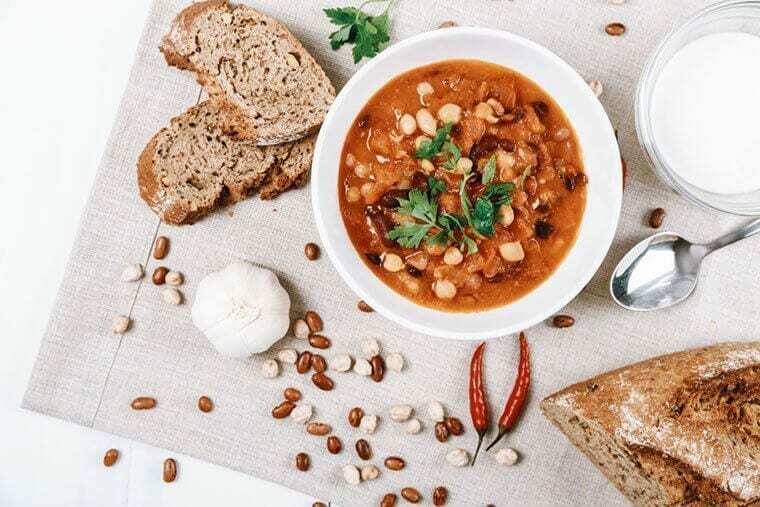 From the perfect crock pot turkey chilli to a zesty fresh soup, discover the lively winter recipes keeping us going through the cold, dark grasps of the winter weeks. In a large pot or dutch oven, heat 2 tbsp olive oil over medium heat. Add onions and cook until translucent, roughly 3-4 minutes. Meanwhile, cut off stem end and half the jalapeño lengthwise, strip the seeds and white ribs off the pepper. Lay jalapeño halves cut-side facing down on cutting board and cut lengthwise into ¼ inch slices. Optional: save a few for garnishing. Add minced garlic, jalapeño slices, ground cumin, dried oregano, chili powder to pot for 1 minute, stirring frequently. Next, add turkey, ¼ tsp salt, 1/8 tsp black pepper, breaking up entire mixture with a wooden spoon as it cooks through, about 7-9 minutes. Stir in white beans, canned tomatoes, chopped Swiss chard to pot. Combine thoroughly and mix for 1 minute. Then, pour in low sodium chicken stock, increase to high heat until mixture starts to simmer, scraping bits that stick to bottom of pan with wooden spoon. Reduce to medium heat and simmer until chili has thickened, about 40-50 minutes and liquid has roughly reduced by half. Taste mixture and add salt and pepper as needed. Ladle hot chili into four serving bowls, garnish each bowl with jalapeño slices and 2 Tbsp white cheddar cheese (optional). Dig in! Warm the olive oil in a large Dutch oven or pot over medium heat. 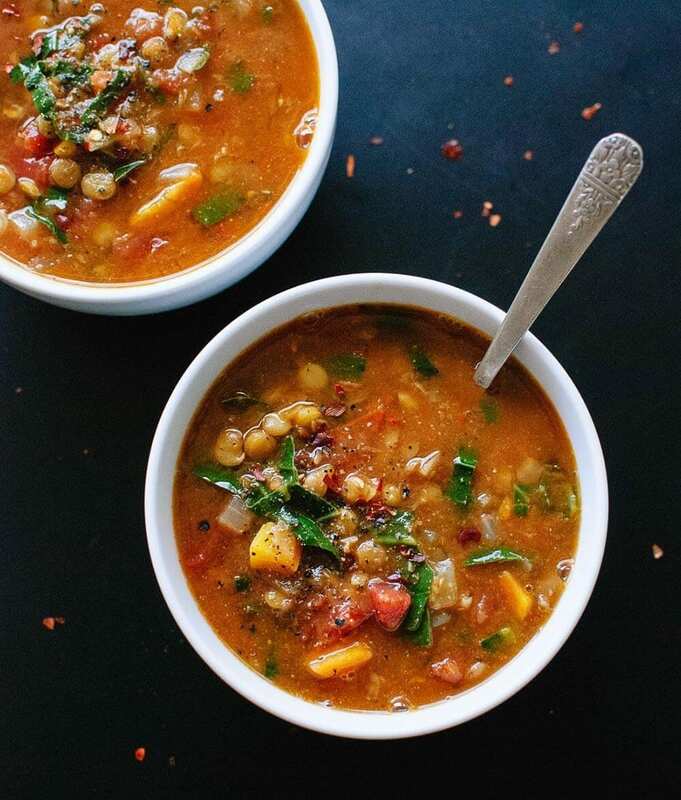 One-fourth cup olive oil may seem like a lot, but it adds a lovely richness and heartiness to this nutritious soup. Once the oil is shimmering, add the chopped onion and carrot and cook, stirring often, until the onion has softened and is turning translucent, about 5 minutes. Add the garlic, cumin, curry powder and thyme. Cook until fragrant while stirring constantly, about 30 seconds. Pour in the drained diced tomatoes and cook for a few more minutes, stirring often, in order to enhance their flavour. Remove the pot from heat and stir in the juice of half of a lemon. Taste and season with more salt, pepper and/or lemon juice until the flavours really sing. Serve immediately. Leftovers will keep well for about 4 days in the refrigerator, or can be frozen for several months (just defrost before serving). Preheat the grill to full whack and place a large tray on a shelf close to the heat. Trim the courgettes and aubergine, slice lengthways into ½ cm pieces, then place in a bowl. Sprinkle generously with sea salt and toss, then put aside. Pick the basil leaves, set aside and finely chop the stalks. Peel and finely chop the garlic. 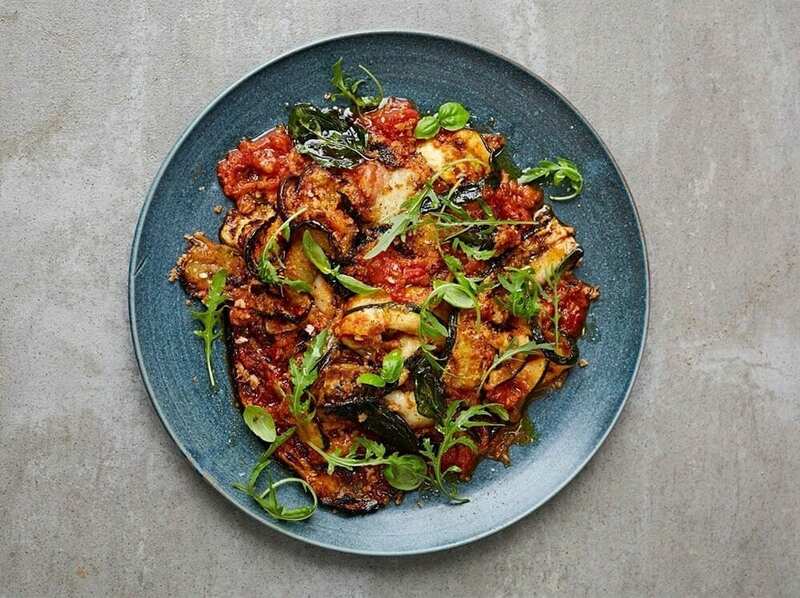 Heat ½ tablespoon of olive oil in a medium saucepan over a medium heat, add the garlic and basil stalks, then fry gently for 2 minutes before adding half the tomatoes (save the rest for another day) and the same volume of water. Cook for 10 minutes, or until it reaches a saucy consistency. Meanwhile, rinse the courgette and aubergine, then pat dry with kitchen roll. Tip back into a bowl and toss with 1 ½ tablespoons of olive oil, and a good pinch of seasoning. Spread the courgette and aubergine on the hot tray and slide under the heat (you may need to do this in batches, as you want the veg in one layer). Grill for 5 minutes, or until browned, then flip the veg grill for a further 5 minutes. Keep an eye on the veg as it grills, then tip into a bowl. Taste and season the sauce, then pour over the vegetables. Tear over the basil leaves and mix. Spread evenly on the tray and tear over the mozzarella. Sprinkle with breadcrumbs and grate over the Parmesan, then slide back under the grill. Grill until the cheese has melted. Meanwhile, squeeze half the lemon juice into a bowl, add 1 tablespoon of extra virgin olive oil and pinch of seasoning. Mix well, then toss through the rocket. When the parmigiana is bubbling and delicious, divide between plates and serve with the rocket. Spoon the cooked squash and carrots into a blender. Pour the liquid left from cooking into the blender and add almond milk and spices. Begin blending on low and turn up to medium high and blend for approximately 30 seconds. Serve immediately or return to saucepan and keep warm until ready to serve. Refrigerate or freeze leftovers. 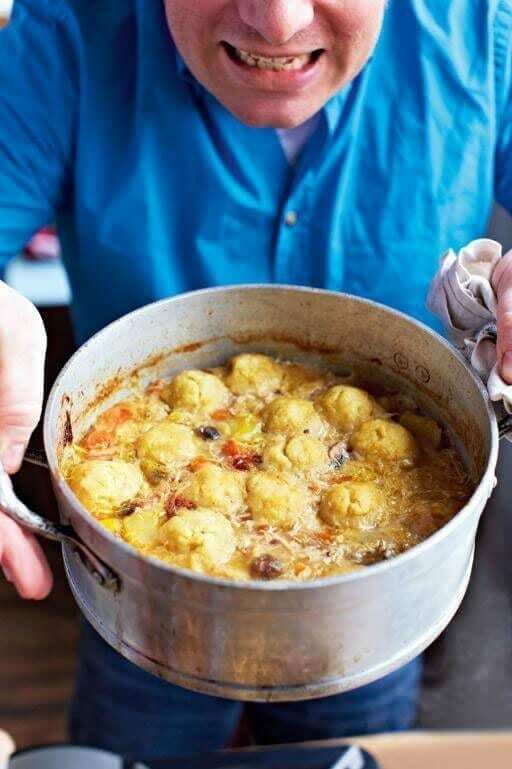 Sometimes it’s not all about zest and spice, other times, all you need is some good chicken stew and comforting dumplings to keep the internal fire burning. 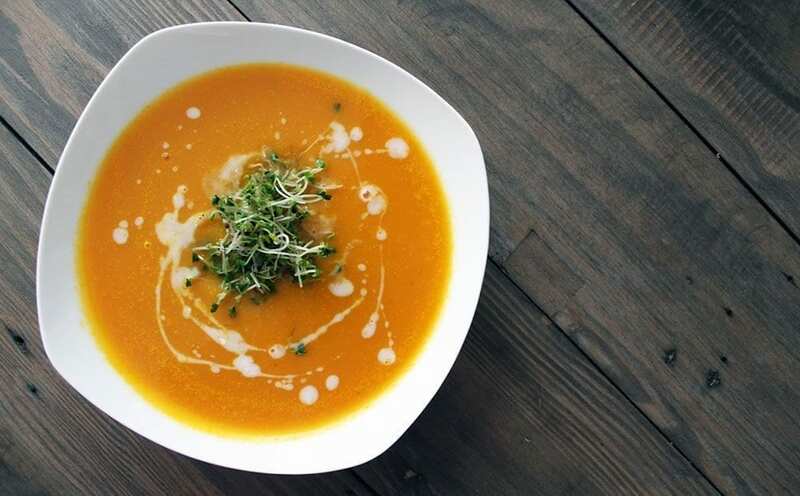 This meal, although it seems too comforting to be true, actually does wonders for the immune system. This is a great choice for a cosy night-in with the family, and adds a bit of variety for using up that leftover roast chicken you had over the weekend. You’ll get heaps of slow-burning energy and lean protein which is perfect for cell growth and repair (and kids go nuts for this). Just make sure you have a couple of hours to set aside, as this wholesome dish needs time to cook. For this recipe, you will need 1 leftover chicken carcass, plus up to 300g leftover cooked chicken. Strip all the meat you can find off the chicken carcass, and put aside. Place the carcass and any bones in a large pan and use a rolling pin to smash them all up. Cover with 1 litre of water, bring to the boil, then simmer for at least 30 minutes, skimming away any scum from the surface. Meanwhile, finely slice the bacon and place in a large casserole pan on a medium heat with a lug of oil, while you peel and chop the onions, carrots, and potatoes or celeriac into 2cm dice. Add to the pan along with the thyme sprigs and bay leaves. Cook for 10 minutes, stirring regularly. Halve and stir in the mushrooms, along with the leftover chicken and plain flour. Pour the stock through a sieve straight into the pan (topping up with a little water, if needed) and let it simmer for 20 minutes, or until thick and delicious, while you start your dumplings. Place the self-raising flour and a pinch of sea salt in a mixing bowl. Coarsely grate in the butter and rub together until it resembles breadcrumbs. Add 100ml of cold water and bring into a ball of dough. Divide into 12 pieces and roll into balls. When the time’s up, loosen the stew with a good splash of water if needed, season to perfection, then transfer it to an ovenproof pan and place the balls on top. Pop the lid on and bake at 190°C/375°F/gas 5 for 30 minutes, or until hot through and the dumplings are fluffy and cooked. Serve with some seasonal greens.